BY APPOINTMENT: Salon Tasting daily 10:00a, 12:30p, 2:30p. PINOT GRIGIO, MERLOT & ALEXIS Cabernet Sauvignon. 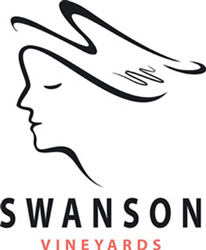 Swanson is also known for producing smaller quantities of Chardonnay, Cabernet Sauvignon, Viognier, Sauvignon Blanc, Sangiovese, Petite Sirah, Rosato, Zinfandel and a selection of Sweet Wines. An intimate, intensely decorated room with coal-colored walls adorned by seventeen coloful paintings by noted Bay Area figurative artist, Ira Yeager. "Every tasting is like a little cocktail pary held in each guest's honor." Catering to the traveler looking for the less attainable. Music in Tasting Room: On most weekends during the summer you'll find the handsome Michel Michelis serenading you in our courtyard as you enjoy your tasting. He plays a traditional barrel organ while he sings French classics. View from Tasting Room: You really feel like you've discovered something special when you arrive. The walkway is lined with beautiful lemon and orange trees. Our courtyard is surrounded by beautiful gardens. You truly feel like you've escaped to another time and place. Wine Education: Our knowledgeable and friendly wine educators called Salonnieres will take great care of you while sharing the Swanson story. To join the wine club, visit www.swansonvineyards.com or call 707-754-4018. Swanson Vineyards' Wine Club offers ways to obtain Swanson wines, including winery-only wines, a 20% bottle discount, complimentary Salon tastings for you & a guest plus invitations to special winery events and parties. 10% discount to local residents on purchases of core wines. Swanson Vineyards is certified under the Napa Green Winery Program by the Napa County Department of Environmental Management (DEM) and the Association of Bay Area Government’s (ABAG) Green Business Program and completed all the regulatory components needed for environmental sustainability. These components included developing water and energy conservation methods, preventing pollution, and reducing solid waste. In addition to developing sustainable winery practices, this program is set to become the standard for the state of California. Swanson Vineyards is certified under the Napa Green Certified Land Program. Swanson Vineyards has created and implemented a customized farm plan with measured results that addressed all aspects of its property, vineyard land as well as non-farmed land, including practicing soil conservation, water conservation, stable drainage, riparian corridor enhancement, fisheries and wildlife habitat enhancement and long-term improvement and sustainability.